Those gathered in cities and towns from Boston to Houston to Seattle said Trump “crossed a red line” when he picked Matthew G. Whitaker as acting attorney general after asking and receiving Sessions’s resignation on Wednesday. Whitaker, a political loyalist, has criticized the special counsel’s probe into possible collusion between Russia and Trump’s 2016 presidential campaign. 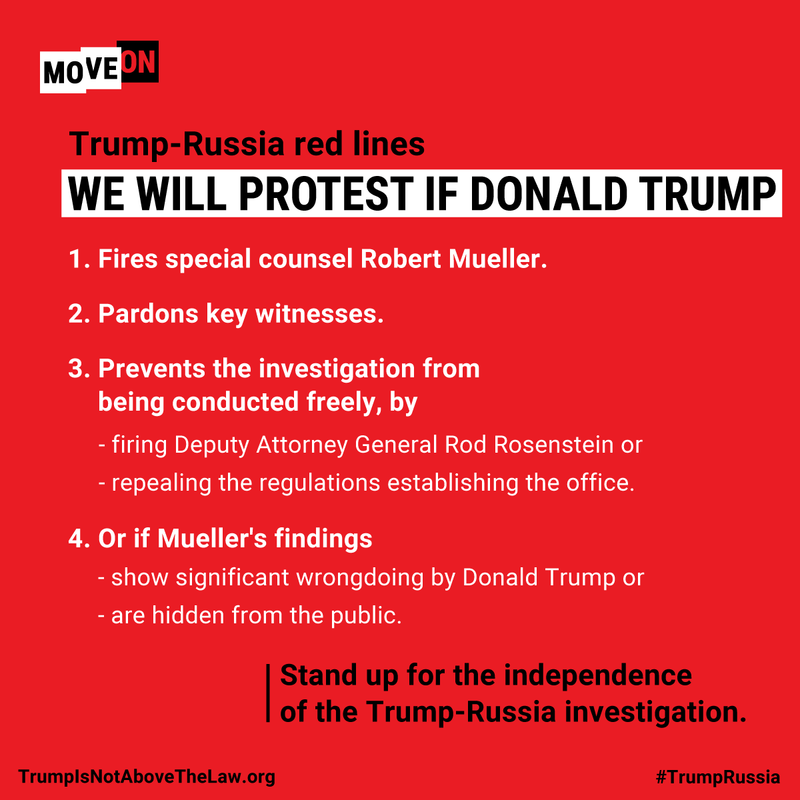 The progressive group MoveOn.org organized what it said were hundreds of “Protect Mueller” protests, held at 5 p.m. local time outside city halls and federal courthouses, in parks and on downtown streets and university grounds. People held homemade signs with messages such as “President, not King” and “Not above the law.” A very unofficial survey suggested many had made a special trip into central Boston for the rally, rather than happening upon it as they left work. Sean Going of Medford carried a homemade sign and attended the protest with his wife, Lisa. "We’ve normalized this dystopia too much,” he said. Lisa Going said she thought the rallies were mostly to buoy the spirit of protesters and wouldn’t have much effect on the Trump administration. But she said she feels protesting — which she’d never done until two years ago — is important. “Trump turned us into protesters in our 50s,” she said. Protesters mingled with tourists in Times Square as the sun set in the late afternoon and the glow of huge electronic billboards illuminated the scene. Some out-of-towners joined the demonstration, which marched south to Union Square. Jay Sheen, a retired lawyer, said he does not get many opportunities to protest the president in his hometown of Salt Lake City. “Utah is a deep red state,” he said. “I believe in the rule of law, and Trump is trying to destroy that." In Lafayette Square across from the White House, several protesters in the crowd of several hundred held letters spelling out “Save Mueller” in white lights. They called for the acting attorney general to recuse himself from any involvement in the special counsel’s investigation. Walter Schaub, the former director of the U.S. Office of Government Ethics, told those gathered: “We are in a full-blown constitutional crisis, and we are here because Donald Trump thinks he is above the law. What’s at stake is nothing less than the rule of law and the integrity of our republic. Mueller must be protected, so let’s demand it now." Downtown’s Federal Plaza was the scene where 4,000 protesters came on a raw, wet evening. That included Senate Minority Whip Richard J. Durbin (D-Ill.). As an inflatable “Baby Trump” looked on, Durbin told the crowd: “We must hold this president accountable and not let him interfere with Mueller’s investigation.” Trump’s decision to replace Sessions immediately after the midterm elections was “significant,” he said. People here worried by Trump’s action on Sessions kicked off their rally at a park named for Washington state’s first openly gay legislator, Cal Anderson. Organizers said about 10,000 people had registered. As the event in the park turned into a march downtown to the H.M. Jackson Federal Building, the few hundred demonstrators ultimately were joined by a few thousand. “Recuse,” urged one person’s sign. Sarah Erickson and her husband, Chris Rogers, who are from California’s conservative Central Valley, came with their 2-year-old son, Halliday. They echoed the sentiments shared by many at the rally. Though feeling some relief from Tuesday’s election results that returned control of the House to Democrats, people said the chaos within the Justice Department and the threat to the Mueller investigation remain deeply disturbing. “We wanted to be here to show that people are watching. . . . We have to remain vigilant and be ready,” Erickson said. Gov. Jay Inslee (D) showed up to speak. So did Noah Eden, former branch chief of the National Counterterrorism Center, and Rep. Pramila Jayapal, a Seattle Democrat who sits on the House Judiciary Committee. Brittney Martin in Houston contributed to this report.